Here Comes the Mermaid Bride! The bridesmaids will be coming soon. Please send me any name ideas for the Bridesmaid’s name. If I use it I will send you an 8 x 10 print of your choice from the Mermaid Shack on Etsy. I will be using these images on Zazzle too. They will make great Mermaid Bachelorette t-shirts and hats! So where is the groom? He is a work in progress! I have such skill in creating beautiful graceful mermaids but for some reasons the grooms I have attempted to draw look like Popeye and Brutus. A work in progress!! I would be happy to design any custom Mermaid Wedding or Mermaid Bachelorette items so feel free to contact me. There are unlimited possibilities for these girls. Shower invitations and favors, mermaid wedding thank you notes, and don’t forget the gift options! Send in your ideas for a Mermaid realted Bridesmaid’s name for the Mermaid Shacks Mermaid Bridal collection. The winner will receive an 8 x 10 print of their choice from my Etsy shop. I will randomly award a prize to one lucky contributor if I have divine intervention and come up with a name on my own. Not creative? Then email me at hello@mermaidshack.com or use the contact page to vote for your favorite print in my Etsy Shop and you will be entered in to a drawing for a Free Euro Bumper Sticker. I will award ten Euro Mermaid Bumper stickers. If I hear from 1 person, they will receive 10 Euro Mermaid Bumper Stickers, 5 people- 2 each and so on and so on. All contest on this page end July 31, 2014. I will post the first name of the winners on August 1 and will email the winner for their shipping address. I will tweet when I have the drawing so follow me on Twitter! You are welcome to enter both contests! 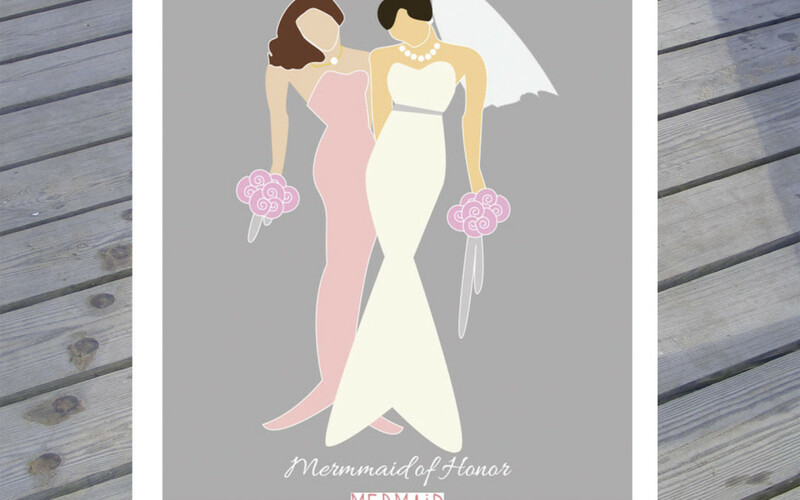 So, head on over to the Mermaid Shack on Etsy and have a look at the Mermaid Bride and the Mermaid of Honor print. Make sure to follow me on Esty so you will see the new Mermaid Bride line as it develops!